Regular and heavy duty bedside commodes, raised toilet seats, and toilet safety frames for hygiene and bathroom safety. Our medical bathroom safety and shower accessories category contains products that assist users in the shower and bath tub. 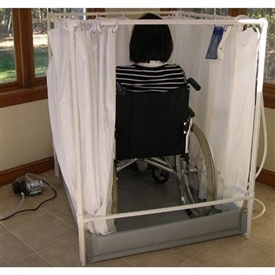 Bath Lift and Bathtub Assists for individuals needing assistance in the bath. We offer wide choices of high quality shower commode wheelchairs with different seat sizes and arm styles used for showers. With a large selection from the leading manufactures such as Invacare, Eagle, Nova, Medline, Carex, Drive, and MJM. We believe we have the Shower Wheelchair or Shower Commode Wheelchair you are looking for. ActiveAid Tilt-in-Space Shower Chairs/Commode Chairs are available with either 18" or 20" seat width and have a 350 pound weight capacity. Thank you for shopping at the bath and shower department at the Medical Department Store. We have provide a wide variety of bath and shower aid products for our customers to use as a resource, both healthcare professionals and individuals. These products are essential for those who have needs that are related to limited mobility.